What is a perfect online sales process? And how can it help to create efficient eCommerce ecosystem? – Are the most vital questions for online business owners. 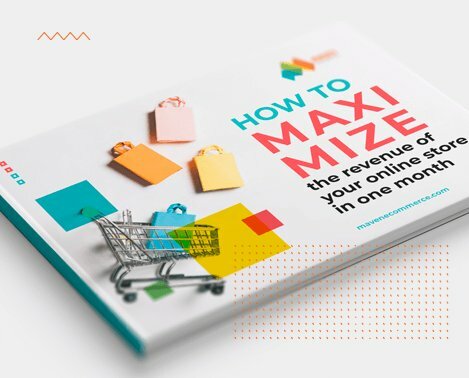 I am sure you read a lot about how to attract visitors to your web store and how to build the ideal customer experience. But when clients get to the final destination, I mean when they click “purchase” at your eCommerce site and manager takes the order, do you know what happens next? The online marathon for sales manages, financial departments and delivery service begins. All these people are part of a sales system in every online business. The goal of every eRetailer is not just to encourage customers to buy products but also makes hyper-effective and solid eCommerce ecosystem. Statistics shows that sales departments spend 49% of working time during the day on dealing with the administrative routine. Creating a successful sales system can be achieved by synchronization and acceleration of external and internal business processes. The idea behind the improvement of both processes is automation. 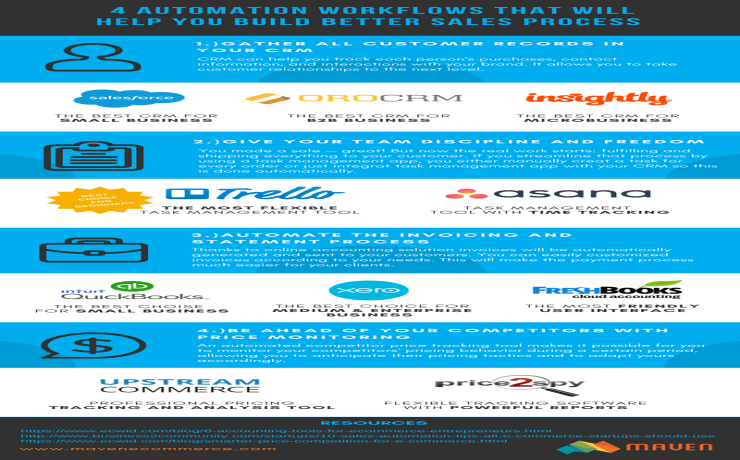 Of course there are dozens of sales automation tools to choose from, but I have carefully analyzed our client’s sales processes and outlined four key areas of sales automation systems which will definitely help you to speed up your internal and external collaboration. No doubt, Customer Relationship Management (CRM) is a fundamental part of any business operation. With the help of CRM system you can easily organize customer information, track sales opportunities and improve employees collaboration. Salesforce is a Cloud Based CRM and one of the most popular solutions used by online stores. It combines CRM functionality, marketing and merchandising modules. One of the main Salesforce advantages are AI-powered commerce capabilities. Such innovative feature can help you to create highly personalized customer journeys. Pricing: Salesforce offers a free plan, which has limited features. Starter package costs $25 per user per month. OroCRM is an open-source cloud CRM tool with the most flexible integration functionalities. Oro solution can be easily connected with the leading ecommerce platforms such as Magento, Amazon and e-Bay. Moreover Oro has its own business application system for online store development named Oro Commerce. Pricing: A 14-day free trial is available with no credit card required. Insightly CRM is a great fit for small eCommerce business. Like most CRM tools, it lets managers track sales and emails, schedule tasks and generate detailed sales reports. Insightly also has an easy-to-use interface and can be integrated with key marketing tools (Mailchimp, Dropbox, Zapier, etc.) and social media platforms. Online sales require a lot of planning activities. Managers need to communicate with clients, send documents and collaborate with all company’s departments on a daily basis. Using a project management tool can help to manage e-commerce projects effectively. Thanks to Trello features you can easily run your projects/tasks in a proper and simple way. This tool has a drag and drop functionality, so it allows you easily organize task cards (e.g. To Do, In Progress, Ready to Test, Done, etc). Trello members can be informed via email about any project changes. If you have never used project management tools before, Trello is the best choice for beginners. Pricing: Trello is absolutely free.Business package costs $9.99 per month with extended possibilities. This project management tool enables keeping your work organized and tracking the progress. Asana allows you comment directly on task and create project conversations. System has a smart inbox, so you will receive notifications only with the needed updates instead of flood of unwanted messages. Pricing: Asana offers a free package for up to 15 team members. For more members and top features price starts from $9.99 per member per month. Of course it is very difficult to manage financial and accounting parts manually, especially in eCommerce business. That’s why financial management automation is a crucial to eRetailers. FreshBooks is a cloud-based accounting tool for management of every aspect of business finance.It is used for streamlining clients invoicing and tracking expenses. Freshbooks has powerful financial report dashboards, so you can easily understand the current state of your business. Pricing: Prices start at $15 per month. FreshBooks offers a 30-day free trial. Another great tool for financial management is QuickBooks. It can be integrated with main business applications, like shopping cart, inventory management, point-of-sale (POS), CRM and sales tax platforms. QuickBooks provides 360 view of your sales process thanks to custom reports. Pricing: QuickBooks has a 30-day free trial. Pricing starts from €4.20 per user per month. This accounting management system was designed to meet requirements of small and medium businesses. Xero is a preferred choice among other financial management tools because it is cloud-based and provides seamless integration with more than 450 business tools. Xero can be connected with almost all online eCommerce platforms. Pricing: Free 30 day trial. Then $31.99 per month. Today online retailers must quickly adapt to the fast-changing eCommerce environment. One of the most important and effective forces, that help merchants to stay one step ahead of competitors is pricing. Typically, the vast majority of eCommerce owners track price changes manually. Unconditionally, it’s a very time-consuming process. Pricing Comparison Engine can easily solve this issue, thanks to automation. This tool automatically collects competitors pricing and product information. This is a price comparison and monitoring tool, which help online retailers monitor competitors activities. Price2Spy has a robust features to identify who your main competitors are, see the differences in assortment and market positioning. This ultimate tool also includes: multi-currency pricing monitoring, advanced analytics and Minimal Advertising Price violations detection. Pricing: Price2Spy has free 30 day trial. Basic Small package costs $19.95 per month. Upstream Commerce is a multitasking cloud-based tool which was created for a professional pricing tracking and analysis.The intelligent soft provides real-time monitoring of your competitors and their SKUs analysis. The biggest challenge of automation implementation is a lack of integration. Most companies don’t upgrade their business because of the fear that they wouldn’t be able to integrate new technologies into their existing structures. To avoid this and to make sure technologies will be a vital addition to the business model rather than an unfortunate experiment, Maven develops an integration agnostic service for the eCommerce industry. The main benefit of this approach is the ability to integrate all the needed functionality without adding excess features and breaking internal business processes. Our service is based on the deep analysis of every e-store individually, we offer the best tools and options to empower your eCommerce ecosystem, taking into consideration your specific needs and results you want to achieve. Contact us and discover more about all integration options for your business!